This biennial event, whose fame has gone far beyond national borders, will bring together Vietnamese and foreign artists for shows in various locations in the Hue Citadel. Forty-two artistic troupes, including 20 foreigners from all five continents, have registered for the 2018 Hue Festival. When is the Hue Festival? It is under the sign of cultural diversity that will be held from April 27 to May 2, 2018 the Hue Festival. 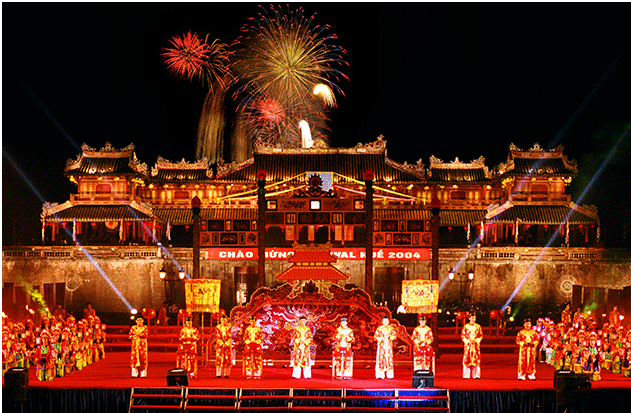 The festival kicks off with the opening night celebrating the 710th anniversary of the founding of Thuan Hoa – Phu Xuan (now Thua Thien-Hue), as well as the 380th anniversary of the birth and development of the city of Hue. This will be the ninth edition of this international event whose aim is to promote the Vietnamese cultural and artistic heritage of Hue in particular with the reproduction of the activities of the royal court of the past. We take advantage of the announcement of this extraordinary event to present you some cultural and natural singularities of Hue. In Hue and its suburbs, almost all houses have a garden. The Garden House is emblematic of the original architecture of the ancient imperial city of Hue. Its charm is first of all the harmony between man and nature. Indeed, the continuity of nature to the habitat is ensured by the garden ordered according to the rules of geomancy. The house-garden designates a specific type, where the house has a wooden frame and forms with the garden a small area of ​​several hectares. To discover the atmosphere of these small paradises nestling all over the city, it is possible to go to the property An Hiên (veranda Quietude) at 58 Nguyên Phuc Nguyên Street, in Huong Long, not far from Thien Mu Pagoda. There is a beautiful wooden house buried in a garden of Eden. Hue has nearly 1,800 of these nha vuon, which, as well as royal palaces and mausoleums, constitute the identity of the city, make its pride, and preserve all the cultural values​of the ancient capital of the country. In the men of the lagoon, dive into the aquatic world of the lagoon of Tam Giang. Located just 20 kilometers from the ancient imperial city of Hue, Tam Giang lagoon is a real print. It is timeless Vietnam: fishermen throwing their net in the fruity light of dusk, herds of buffalo lacquered mud, white sand hills, fleets returning from the sea … Sovereign instants fertilized by this immutable world as frozen for eternity. The Tam Giang Lagoon is part of the lagoon system of Tam Giang – Cau Hai, one of the two largest and typical brackish water marshes and lagoons in Vietnam. With an area of ​​21,600 ha and a length of nearly 70 km, this body of water crosses 5 districts in the province of Thua Thien Hue. It consists of the mouths of three rivers: Perfume River, Bo River and Ong Lau River. The lagoon is separated from the sea by a thin strip of land about 70 km long. This strip of land is inhabited by about 300 000 inhabitants living mainly from fishing and rice growing. Possibility to combine the discovery of the lagoon boat with a night at the inhabitant for a total immersion in this unique place of great beauty. Generations of the most powerful emperors of the country have left a tremendous cultural heritage but also gastronomic. Considered cultural heritage, the culinary art of the royal court of Hue is considered the pinnacle of Vietnamese gastronomy: it sublimates the refinement, the nobility and the attraction. Refined from the choice of ingredients to confection and presentation, the culinary arts of the royal court of Hue are among those who have helped to elevate gastronomy to the rank of fine arts. Expect sumptuous meals worthy of a royal table. In the restaurants of the city that display the culinary arts of the royal court the pleasure of the eyes are combined with that of the taste buds. The dishes parade and the appetite with the chopsticks does not let go of the dishes with its flavors that bounce in all directions. The popular cuisine of Hue is not left out. Elaborated, more peppery and spicy, it is also more colorful, with shades of red and dark brown than those of other regions of the country. It includes many stuffed or ravioli (banh) and multiple pancakes all delicious than each other. Among the must-fare items of this popular cuisine full of perfumes are the bun bo hue (perfect combination of several ingredients such as vermicelli, banana blossoms, mung bean sprouts, chives, some slivers of beef, a slice of hock of port or a piece of pork and mắm ruốc, small shrimp paste in brine and fermented), banh beo (a crepe garnished with shrimps, shallots and thin slices of beef) or com hen ( rice with mussels). As the region is an important Buddhist center, vegetarian food is often present in the menus.